February 29th, that day that only comes once every four years. 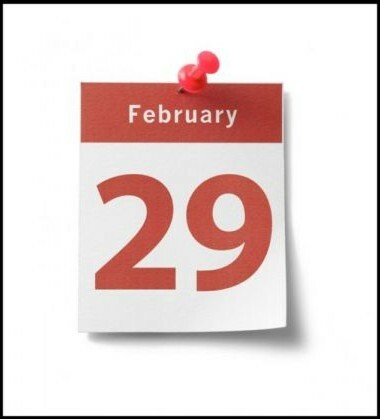 I have often thought it would be cool to have Feb 29th as a birthday. I don’t know anyone whose birthday is Feb 29, but I had a friend who had a son who was born on Feb 29. I also saw an article entitled “Wipe February 29th from the Calendar” but I didn’t read it. It is a stupid idea. I don’t know a lot about the different types of calendars, I think there is one calendar where they add a week to the calendar every several years. We have leap year because it takes slightly more than 365 days for the Earth to orbit the sun. I’m up early this morning. Last night I had a dream about music, everyone had to play it perfectly. I did some upgrades to my Linux computer and I am getting ready to make coffee. I was thinking I’d go back to sleep but I guess not. Sadie Hawkins day..where the girls ask the boys..sorta like Leap year day..where the girls ask the guys to marry them..